Tough enough for the hardest tour... All flight cases are constructed of 9 mm (3/8") pressure-treated plywood. The exterior is covered with a tough- grained finish, aluminium edge protection, and tough steel corners. The wheels are the well-known GUITEL blue rubber type. 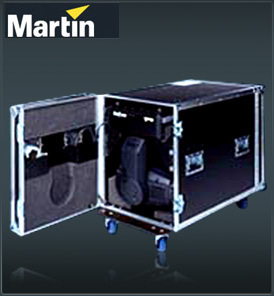 Martin Flight Cases: In order to fully protect and conveniently transport Martin lights while on the move, a full range of durable standard and custom-sized Martin Flight Cases are available. Built to endure the rigors of the touring and rental market, these classic cases are manufactured from top-quality, water repellent 9 mm thick ply. The exterior is covered in a tough, black grained finish with 30 mm wide aluminum edge protection and tough steel corners. Resilient roller castors are mounted to the base for easy roll-on/roll-out and convenient spring-back, steel carrying handles provide for easy grip and handling. Custom flight cases can be made in any exterior color, to any requirement or with custom foam-lined interiors. Touring Kits: Built to the same tough standards as the Martin Flight Cases, Martin touring kits are specifically built, mobile spare and support units for use on the road. Martin has equipped each touring kit with an emergency listing of the most urgently requested spare parts and essential tools. Typical touring kits include screws, fuses, a complete set of effects modules, lenses, fans, stepper motors, heat filters, lamp sockets, connectors, cables, clamps and starters. Four large castors allow the touring kit to be rapidly moved wherever needed.